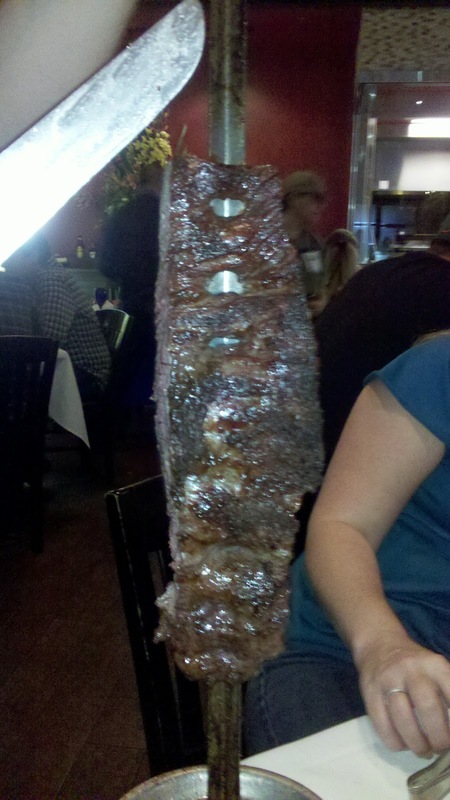 Alright---here it is….the long awaited review of Texas de Brazil. After 2 visits, one during dinner and one during lunch, Tastes Of Orlando is ready to break it down for you! 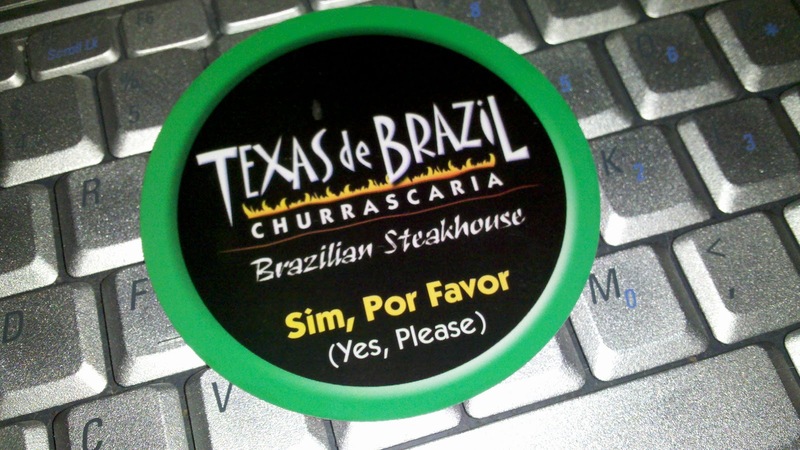 Texas de Brazil is what is known as a churrascaria…which is Portuguese for Brazilian steakhouse. Churrasco is the cooking style, which translates from the Portuguese for 'barbecue'. To be more precise, it’s a South American style rotisserie in which the meats are seasoned and cooked over an open flame grill. It owes its origins to the fireside roasts of the gauchos of southern Brazil traditionally from the Pampa region, centuries ago. Inside Texas de Brazil you find a modern rodízio service offered. Rodizio is simply a fixed price you pay, and the waiters bring an offering of food to each customer at several times throughout the meal, until the customers signify that they have had enough. You are given two cards to display. One says quite simply, Sim, Por Favor..or (Yes Please) and is green. The other card says Nao Obrigado or (No Thank You) and is red. Your server will explain the whole order of events to you. When you are ready for meat - Passadores (meat waiters) come to your table with knives and a skewer, on which are speared various kinds of meat, be it beef, pork, fillet mignon, lamb, chicken, or sausage. The 50 plus item soup and salad bar is pretty spectacular and is worth a trip to the restaurant just for that. In fact, you can actually do that if you go during lunch time and order the “Light Lunch” option. The salad bar is large and looks beyond tempting. Lettuce, salad dressings, cured meats, garlic shrimp, smoked thick cut bacon, cheeses (goat, Parmesan, fresh buffalo mozzarella), and artichoke hearts, hearts of palm, rice, black beans, bread, and lobster bisque. Be sure to get some of that delicious thick cut smoked bacon added to your salad, or just eat it on the side---it’s really good. 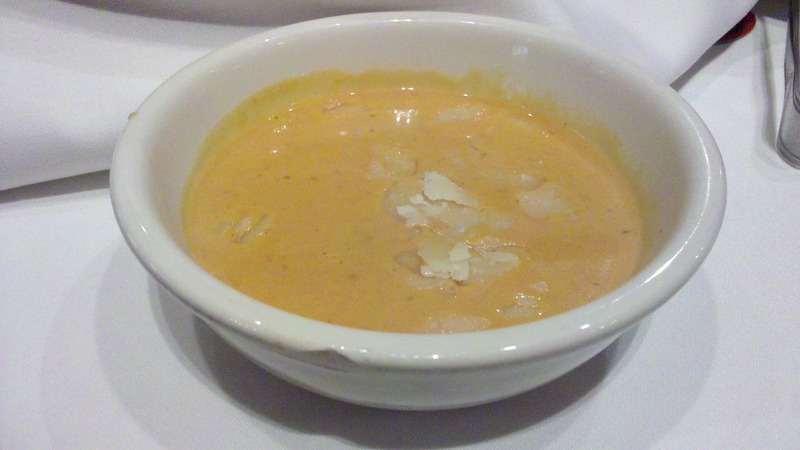 The lobster bisque always gets rave reviews. It’s kind of funny to think about a steak house having such a great lobster bisque---but it’s really that good. My mother in law who dined with us on the second occasion ate more lobster bisque and salad than she ate meat. But you must use caution---DO NOT FILL UP ON THE SALAD BAR…. Aside from the salad bar, you are also presented with side dishes at the table. They include: Brazilian cheese bread, fried bananas with cinnamon, and garlic mashed potatoes...all of which are equally delicious! Most the beef is cooked medium to medium well ---you can specify to your gaucho to bring you a medium well piece if you prefer. At times the meat may be a little to red for some tastes. Just ask for a medium well piece. 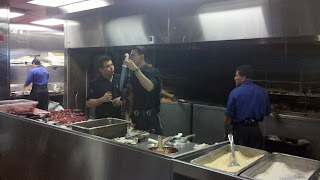 The selection of beef included the house sirloin, flank steak, garlic sirloin and bacon wrapped fillet mignon. 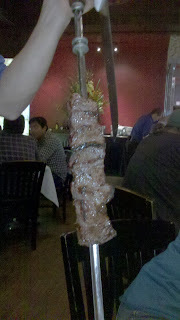 Our server also brought us a piece of meat called Picanha. Which was a well seasoned and grilled piece of top sirloin that was very good. 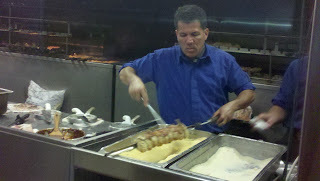 All the beef is spectacular---but especially the bacon wrapped fillet which is only available at dinner time. But fear not---if you go for lunch---the flank steak is out of this world. I almost told our server to drop the whole skewer off at our table!! If you get your fill of beef then move on to the BBQ Pork spare ribs, garlic chicken, bacon wrapped chicken, leg of lamb, or the chorizo sausage. The chorizo is mucho good and anything wrapped in bacon makes it twice as nice. The lamb is usually only available for dinner, however after asking our server during our lunch visit…a fresh leg of lamb suddenly appeared, and it was awesome. I COULD NOT EAT MORE OF IT. Now if by some miracle you can still fit more after all of this, they do have an al a carte desert menu which includes…..
All of the deserts sounded very good and looked even better passing by our table. Unfortunately Tastes of Orlando could not fit anymore. Perhaps next time we will get some desert to take home. And yes there will be a next time…and a time after that and a time after that... and then some. 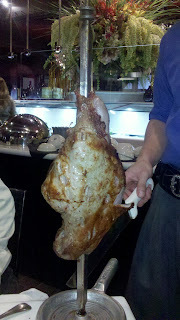 Tastes Of Orlando loves Texas de Brazil! The food was wesome and the service was excellent and it is well worth the money! Before you go to Texas de Brazil make sure you--sign up for their Eclub @www.texasdebrazil.com for special events and reduced rates. We signed up and went for my birthday and got a pretty sweet buy one get one free meal deal. Reservations are almost required---unless you want to wait over 70 minutes. Light Lunch is $19.99/pp and is soup and salad bar only. Texas de Brazil : a "carne amantes paraíso"